Keep your school lunch game strong with this tips for quick and easy school lunch ideas. 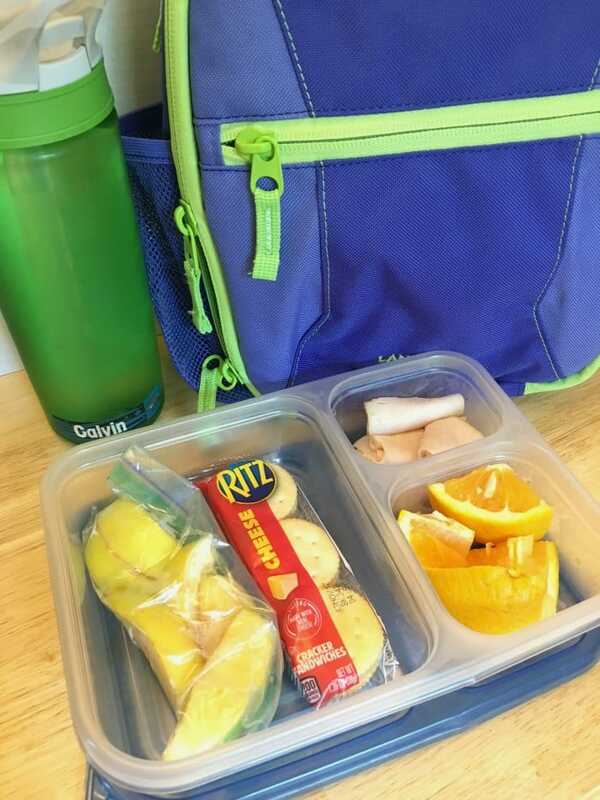 Kids can learn to pack their own lunches in a breeze. My boys will are in elementary school and I am very excited to pass the baton of lunch-making over to them with these easy school lunch ideas. We’ve run the gamut on meal pickiness so I’ve been a little obsessed with my kids’ food for long enough. When my oldest stopped eating cheese, it was a wake up call. It’s time to get them involved. Kids grow up so fast! And since they are learning as they go, I decided to throw in a few hacks to make the process as smooth as possible. Originally posted in 2017 – This shop has been compensated by Collective Bias, Inc. and its advertiser. All opinions are mine alone. #RITZFilledBackToSchool #CollectiveBias Post contains affiliate links. We alternate between packing lunch and buying it at school. I do like to pack most days so yummy on-the-go foods like RITZ Filled Sandwich Crackers from Kroger are great to throw in as a snack, a side in the lunchbox or an after-school treat for the ride home. I like to have lots of easy to grab foods so we can put together meals on a moments’ notice. My family is out the door by 8am on school days and that’s pretty early for us! 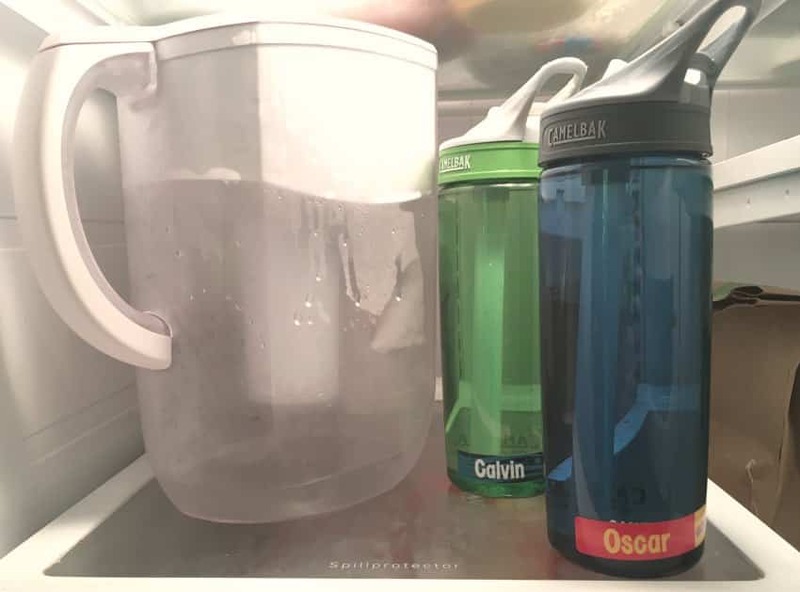 To make our mornings a little easier, we fill water bottles the night before and put them in the fridge. I don’t know why but there is something I hate about filling water bottles before I’ve had coffee. Is it just me? 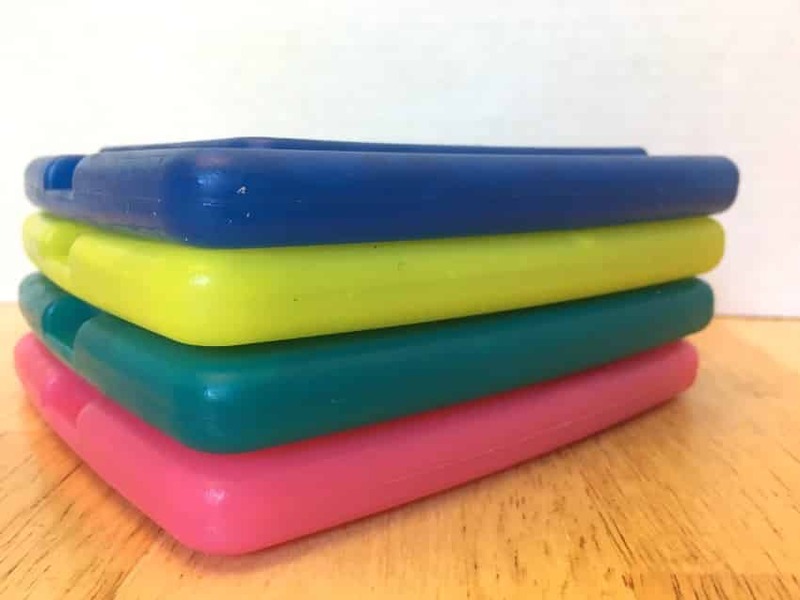 We also use cold packs in our lunch boxes every day so I make sure they are in the freezer the night before. Even if we don’t have perishable lunch items, the cold pack really helps food from getting weird. Nobody wants a weird lunch. And while the boys will be primarily responsible for lunch-making, I love sending a little note to brighten their day. I’m not interested in really elaborate creations so I love this idea from a friend of mine to add some stickers of favorite things and write around them. 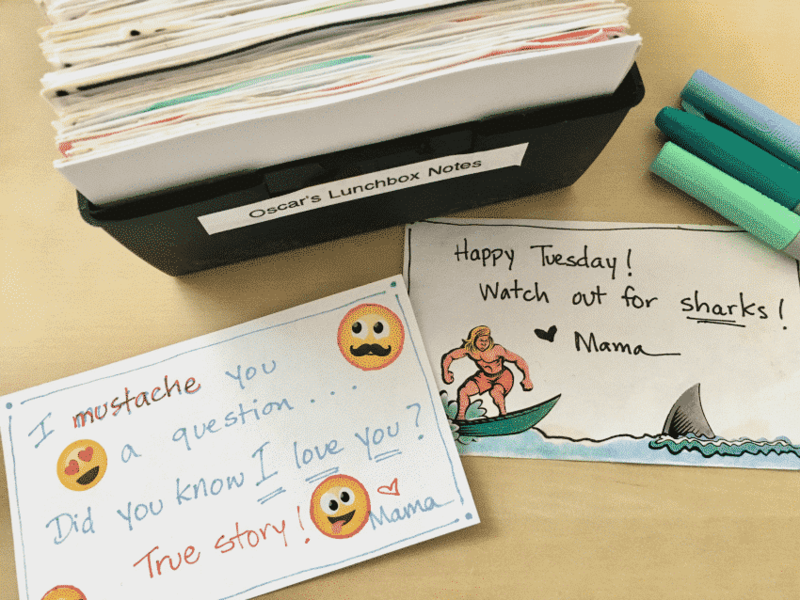 I’ve been doing this since my oldest was in kindergarten and both boys still love their notes. For the days when we just don’t have time for stickers, I reuse an older note saved in a recipe box. Our notes are on index cards so it’s a perfect fit! I’m always looking for healthy lunch ideas for my boys, but let’s be honest, kids can be hard to please! Over the years, we’ve found a few things that travel well and keep them full all day like fruits and veggies, various meats and sandwiches, and of course RITZ crackers! I found my RITZ crackers at my local Kroger. Find your local Kroger/Kroger Family of Stores to get your RITZ crackers. TIP: Make sure you check the aisle with packable snacks and not just the cracker aisle. I noticed that my store had them in two different places. In my store, the RITZ crackers were right on the top shelf – and on sale too!. My guys would eat pepperoni every day if I let them. 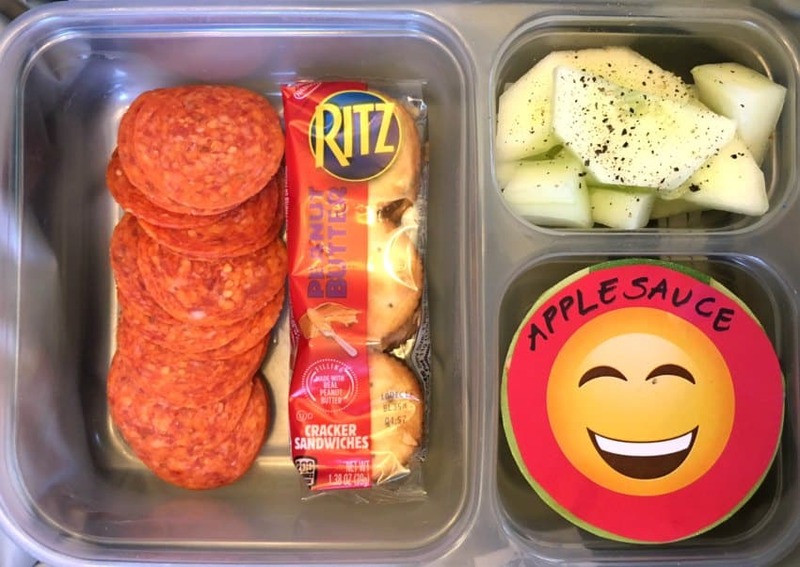 Here I have pepperoni, RITZ Filled Sandwich Crackers, cucumber slices with pepper and unsweetened applesauce. Or you could make these delicious 2-ingredient pumpkin muffins to use all week. Always a hit in our house! We love these reusable containers. I bought a couple packs like these bento boxes and we’ve been using them for years! 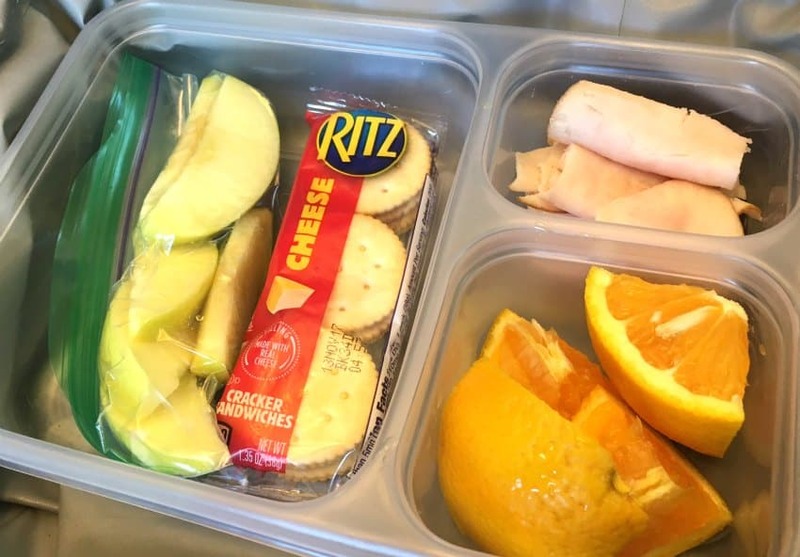 Another tasty lunch idea is sliced turkey with Cheese RITZ Filled Sandwich Crackers, apple slices and an orange or yogurt. My kids aren’t really big fans of bread for some reason, so crackers make a great swap. My youngest loves quesadillas so this meal incorporates one of his favorite foods with broccoli. He has a morning snack at school so I also included RITZ Filled Sandwich Crackers with a few mini marshmallows and chocolate chips for a DIY s’mores treat. Making lunches is just one part of the many tasks we have as parents when our kids go back to school so I think it should be as easy as possible. And if you’re feeling extra sweet, be sure to throw in a fun little dessert! I like to celebrate holidays with food so we made these St. Patrick’s Day treats, but you could do them in any shape or size really. I hope these hacks will save you some time in the mornings and help your kids get out the door and onto their new adventure whether it’s the beginning of the school year or you’re hobbling to the finish line. 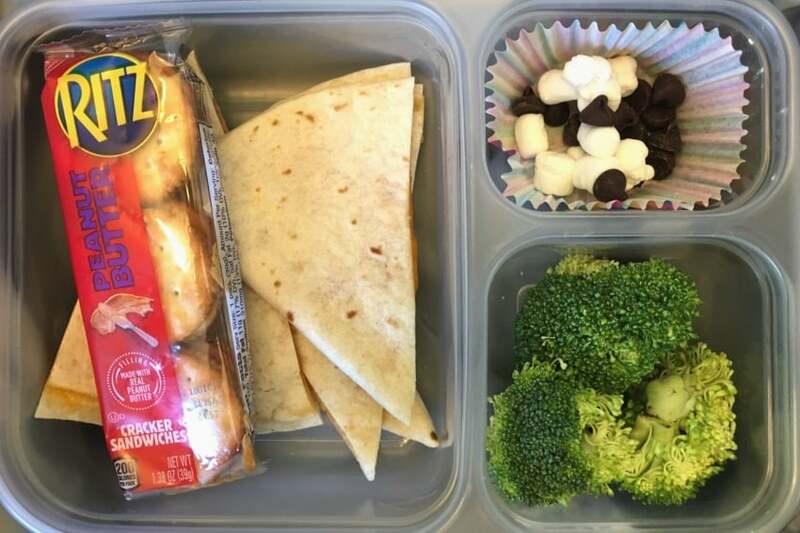 What are your favorite school lunch hacks?